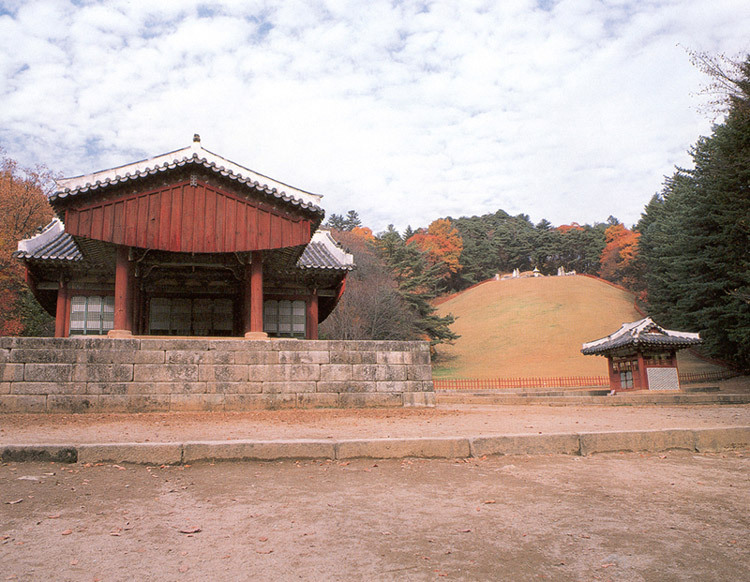 This is a royal tomb called Gwangneung where King Sejo, the seventh king of Joseon, and Queen Jeonghui, his wife, are buried. He reigned from 1455 to 1468. As the second son, King Sejo unseated King Danjong, his young nephew, and reigned in 1455 after his brother, King Munjong, passed away. King Sejo had several accomplishments such as reforming the military and land systems and abolishing the academic institute, considered the source of empowering the vassals. Such accomplishments contributed to strengthening the authority of the king. He passed away in 1468 after suffering from disease. Queen Jeonghui is the first queen in Joseon to hold office in government on behalf of a young king. King Yejong and King Seongjong were too young to run the country. She passed away in the fourteenth year of the reign of King Seongjong in 1483. 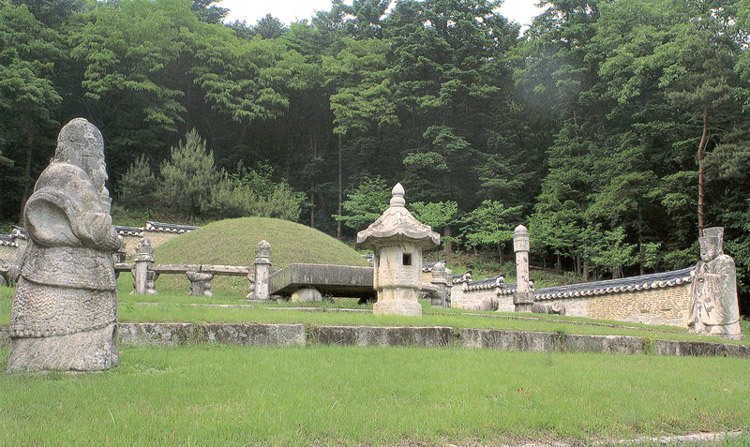 Gwangneung is regarded as important in the system of royal tomb of Joseon. King Sejo left the will to abolish the stone screen and stone room by blocking it; thus contributing to decreasing the financial expenditure of the state and the burden of the people. Around the tomb are balustrades in stone surrounded by other stone sculptures. Twelve zodiac animal deities are engraved on the pillar of the balustrade to offset the absence of the screen stone. This appears only in Gwangneung. Later, 24 directions and other letters are added to the deity engraving. 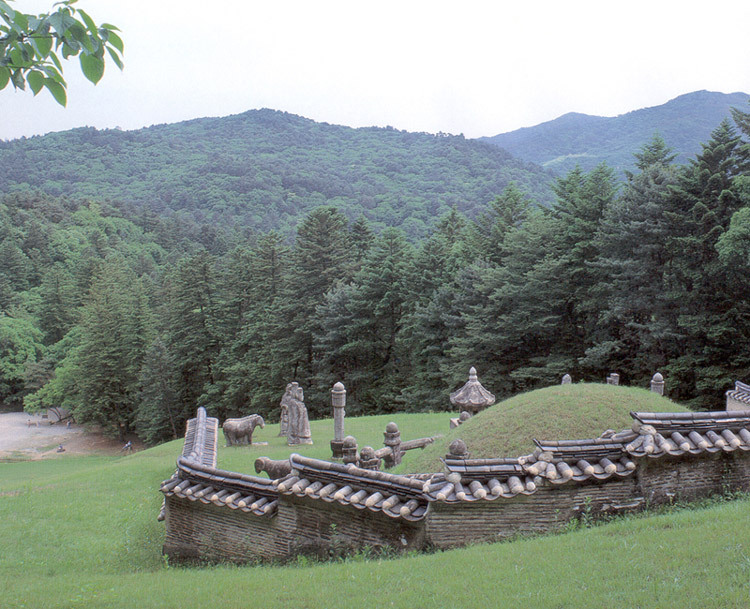 A new method of arranging royal tombs, called Dongwonigang, is applied here. 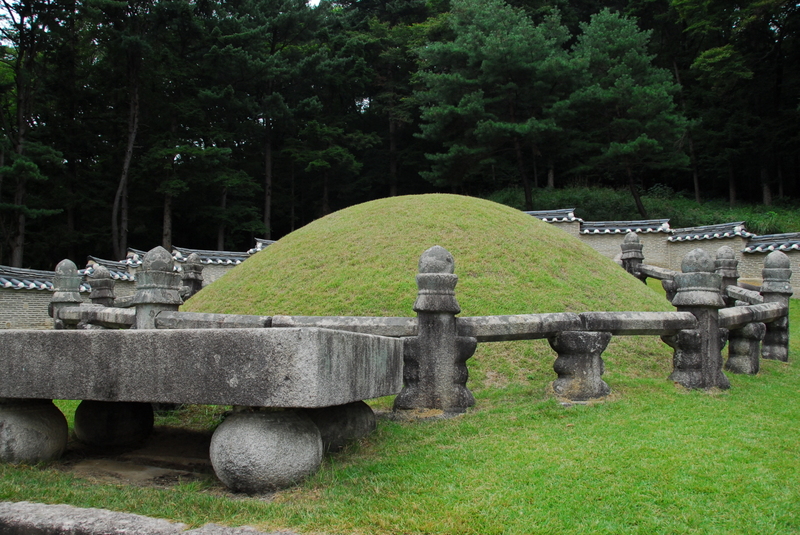 Before the royal tomb of King Sejo and his wife, which introduced the way of putting two hills with graves under a t-shaped shrine, the method used in the tomb of the Great King Sejong and his wife and tombs from Goryeo had been popular. With the styles of royal tombs of Joseon accumulated in the tomb of the Great King Sejong, a turning point in their styles can be seen in King Sejo's tomb.